When I first ran at the two trail run events, “Merrell Adventure Run 2011” and the “Camaya Coast Aquathlon” the categories I joined at were both in the 10 Kilometers categories. The Camaya Coast Aquathlon claimed the toughest trail run I had between the two. The trail run at the Camaya Coast Aquathlon had about 3 kilometers of uphill run, fair amount of downhill run, flat surfaces and sandy beach shore run. The entirety of the race was done between the time of 8:30 a.m. to 10:30 a.m. with the sun streaming its April heat upon the route. Now come the 21k trail run I recently had courtesy of the Nature’s Trail Discovery Run held at Barangay San Andres, Tanay, Rizal last May 27, 2012. This by far my toughest trail run (here I go again with the claim). The race featured uphill run including more than 45 degrees inclined trail that summits Bangkaan to a view overlooking sea of fog swallowing valleys and hill below. Then after hydrating and eating banana the race took us to a steep inclined down slope trail that left the runner almost with only sliding amidst carabao grass and mud as the viable option to negotiate the route. Aside from the mountain trail, the rest of the route which covered the four barangays of San Andres, Sto. Nino, Cayabu and Tinucan, were featured with rice fields, four river and a hanging bridge crossings and dirt roads under the watchful eyes of armed military soldiers but less from race marshals. By the 12th kilometers of the leg of the race my legs were buckling and threatening to quit on me. I was reduced to hiking until I was almost at the last 200 meters of the race. Well, I was not running at the last 4 kilometers of the race because when I caught up with two other runners we end up chatting about our other previous runs and other topics under the sun that we forgot we were in a run event and not in a sight-seeing trip. Two other runners even joined our excursion. It was only after finally some other runners who already finished the race and some race officials who came looking for stragglers and after their prompting us to run the few meters to the finish line that we decided to give it a dash the last 200 meters of the race. By the time I crossed the finish line four hours and probably past quarter had passed since I left the Starting area. Yes I still got my finisher medal and my name and finished ranking will be taken by Philippine Trail Runner Association (PTRA) to be use in the Philippines Ranking of Trail Runners. But my pride had been greatly bruised that I want to do it again to redeem myself given a chance on September 2. Oh, wait there’s still the Merrell Adventure Run 2012 the week after. A week before La Union Ku Ikaika Marathon 2012, I was in Calaguas Island, Camarines Norte getting tan while being smothered with the pristine crystal clear water and powdery white sands of its beach. Both seem to be putting Boracay Island’s counterpart a run for its money. Too much development infringing on nature had resulted to green algae besieging Boracay Island’s own white sand beach and crystal clear water, which hopefully will not happen with Calaguas. The following day I was along the surfing beach resort of Bagasbas, Daet, Camarines Norte eyeing both the waves and the babes. My impression of Bagasbas was that it was like a surfing school ground. The water along the shorelines is not deep but there were plenty of waves to learn and practice the rudiments of surfing. My regret though was that I didn’t attempt to learn surfing while I was there. I thought the trip to Camarines Norte was rather exquisite prelude to the La Union Ku Ikaika 2012 Marathon, which was to be held then on May 19 at San Juan, La Union. Not only I could be mistaken for a Kenyan with my tan, although I preferred to be simply referred to as “si Khen yan”, I thought I will finally see the surfing town of San Juan one of the country’s top surfing destination lined up along with Siargao, Surigao Del Norte, the town which seem to have started the surfing craze in the country, which I had a chance to visit a very long time ago. I have no inkling that at the other side of the seemingly bright prospect I was expecting to happen at La Union Ku Ikaika Marathon 2012, things were rather foamy underneath the calm surface of the event. Ku Ikaika is a Polynesian term meaning “Stand Strong”, Very apt expression to impress upon the participants not only to endure the run and its route but to keep their patience up for the many glitches the event was marred. The signs were all out in the open staring at us in the face as the days towards the events winded down. Race kits release information and assembly place for the transportation to ferry participants to La Union were if not coming in trickle, continuously remain uncertain. On the day of the departure to La Union itself, the assembly point changed its location again as if trying to avoid surveillance satellite up in space. The arrival of the bus that will bring us to La Union came late topped by the very late arrival of three other participants. By the time the bus embarked it was already past 9:00 am. It did not help that I was in Market Market, Bonifacio Global City as early as 7:00 am because the information I was given was still not complete and I had to anticipate for more of the late breaking announcements just to be on the safe side. The chartered Genesis bus (which originally was suppose to be Partas Bus and much earlier a double-decked bus) chose still to have its mandatory lunch stopover at the Genesis Bus Terminal in Tarlac at around 12 noon. Maybe because the were no arrangement for free lunches for the bus driver and bus conductor lunches, the driver opted to have their lunches in the said terminal. Poor participants there were not much choices of meal in that terminal. So, some participants decided to forego eating their lunches for the next stop over at Sison, Pangasinan. Unbeknown to the participants that it was still two hours drive away. Lunch for them was at 2:00 pm. This was not the only bad news waiting the participants. One of the organizers who boarded the bus with us participants announced that the race kits would be released at the race venue upon our arrival. Then he updated us that the kits would be delivered instead at our respective accommodations later in the evening because the race kits were still not available at the time of our arrival due to the delay of delivery from the supplier. Then about an hour later, again adjusted his announcement saying that the race kits could not possibly be released anytime soon within that day or the evening. The race kits instead may be released the following day, which was the day of the race itself. We were told we may opt to run instead with any tops we want and probably with Pentel Pen marked race bibs. 5:30 pm. the bus finally reach Kahuna Beach Resort in San Juan, La Union. The sky was turning murky. Looks like rain was lurking behind the clouds to douse our frustrations. Unlucky for some of us participants, our accommodations were still further away from were the resort where the bus unloaded us. Mine was still a good 8 kilometers away and I was not aware of it at that time. I thought I could just walk to the accommodation for maybe just a few minutes, since it is probably just within the area along the national road with a signage flashing to advertise it. 15 minutes of walking yielded me with still no signs of even a mere announcement in paper that the hotel I am booked was within sight. I hailed a tricycle. It might have been quite a very long walk if I did not relented. Even though I was dropped at my accommodation I still had no inkling of where it was. Had I known of this I wouldn’t booked myself to a hotel this distant away from the race event venue. I simply chose in good faith from among the accommodation the organizers suggested in their Facebook account and since the town San Juan was attached to the address of the accommodation, I thought it was much nearer to the event which was also in San Juan compared with the other suggested accommodations located at San Fernando which was roughly 5 kilometers away from the venue of the event. Thinking I was like at the edge of the province and I need time to travel to the race event I woke up 2:00 am. I was also thinking that the earlier I get my race kit the earlier I can limber up with my routine warm ups. I contracted the tricycle that brought me to my accommodation to pick me up at 3:00 am. Upon my arrival at the venue I noticed there was already bedlam. Participants, some whom just recently arrived from Manila and other places, were pouring in at the registration table to claim their respective race kits. However, only the race bib was being released. I got my personalized race bib with “Fernando” instead of number written on it. I did not remember preferring to put “Fernando” as my personalized race bib. I usually go for “Ken” or “Khen” or the full “Fernando Torres”. Where is the glory in being just Fernando? Anyway, by the time I got my race bib, the race singlets were delivered. More pandemonium ensued in the claiming of the singlets. I had no idea that the sizes of the singlets were too small. Have I known it I would probably be among those trying to have their singlet change size further exacerbating the melee. At 4:45 a.m. the 42k runners were given their gun start. About 15 minutes later we, the 21k runners were sent off. Manila North Road was still bathed in darkness. I was not rushing for I intended to enjoy the route. The 21k route was basically flat land except in the last 2 kilometers of the race, which was at the beachfront therefore sandy. The route would take us from Kahuna Beach Resort, which lies along the Manila North Road until San Juan town proper where we turned left passing rice/tobacco field with stench of hogs’ dump hanging in the air. I learned later that there were runners at this early leg of the race got nauseous. The 21k turn around was just beyond Cabaroan Bridge before the town of San Gabriel and then back towards San Juan and straight into the coast. For reasons that maybe I was just hungry or that it has been awhile since I ran 21k, I felt my stamina was a bit low. I was somehow struggling and running slower maybe. By the time I reached the sandy area of the beach run portion of the race I learned that there were only about 2 kilometers separating me from capping another finisher medal. I felt elated especially when missionaries from the Church of Jesus Christ Latter Day Saint both local and foreign ones welcomed and egged us to go on. Having experienced Skyathon Beach Run twice and recently the Camaya Coast Run, I learned a few good lessons about beach running. I took off my shoes and headed along the shoreline where water surges in. It was supposedly the more compact portion of the beach. But San Juan’s beach seems to defy this. There were lots of portions that the sand were simply too soft and my feet sank deeply thereby slowing and tiring me further. So, I also walked most of the length of the beach as others were doing it. Then upon reaching the last 500 meters I returned to the sea part of the beach, which was now more compact and I sprinted. Few meters more I was back at sands but I thought I left the others far behind that I could afford now to slow down my rush to the finish line. I clocked my finish at 2:46:01. There were talks however that there were three kilometers extra on our run. I was hoping this was true for it means I finished around 2:30 hours. As I crossed the finish line arch the race marshal assigned to meet us at the other side of the arch was collecting our race bib in the manner similarly being done with detachable tag containing spindle hole for time keeping purposes before the onset of electronic timing chips were introduced in local running events. Lately, races utilizes race bibs that have at its upper portion a flap with an electronic chips embedded in it, such as those provided by Runningmate Company. This portion was the one being torn off. But the race bib issued to us had no electronic chips embedded in it neither a spindle hole. So, it was a curious thing that our race bib had to be collected. For runners race bib are quite precious souvenir of the race they just participated with. You see them proudly attach their race bibs at their bags as they leave the race venue and later the bibs would likewise be displayed at home like college diploma. Therefore no runner would want to part with his race bib especially if it was personalized like mine. But I was exhausted. Arguing was the very lasting I want to do at that moment. So, I reluctantly tore off from my chest the race bib and gave it to the marshal. It would later turn out that losing my race bib was the least of the concerns that would be lodged to the organizers later that day. At around 8:30 am I was back at my accommodation but not before I still managed to get lost on my way back. After showering off, breakfasted, taken a nap, watched the end part of the play off with Oklahoma Thunder winning over Lakers in game number 3 replay t the television set, checked out of the hotel and a lunch at San Fernando town proper, I went back to Kahuna Beach Resort intending to while away time before boarding the bus going back to Manila. I thought that with the race event over things would settle down and be quieter at the venue. I planned to take some photograph with my Fuji x-10 or find a comfortable corner to sleep or something. But this was not to be the case. 8 hours after gun start, the 42 k runners were just returning and crossing the finish line arch that was already taken down by the organizers, with harrowing tale as if they just came from an epic wild adventure. It seems that the route of the 42 K was more than what the participants had expected. Their route which in part was similar with the 21k turned rather terribly extreme at the portion where they forked away from the 21 K on their way to Bacsil Ridge an historic landmark in La Union. Their route featured off-road trail littered with fallen overripe fruits, muddy road and a 45 degrees inclined uphill run. As a result the route had taken toll of the participants. I was told there were those that quitted the race. The 4 Kenyans who run this race category when the got out of this portion of the race and on their way to San Gabriel for the turn about, they were pretty much shaken. There was even this 70-year old priest from Lingayen who run the 42 k created great concern and consternation to the organizers. Apparently in spite of the sun streaking high and angrily and the plea of the organizers, police, medical-rescue team for this fellow to quit the race, this fellow stubbornly “standing strong” persisted to finish the race. I was at the organizers table when I heard about this. I was at the table trying to salvage my race bibs, which apparently the organizers decided that it was not necessary to collect the race bibs after all and now were in a box free for everyone to scavenge. Unfortunately, my race bib was taken away by another runner probably with similar name as I am. This despite the fact he knew full well it was not the race bib he used in the race and surrendered to the marshal. How low can one sink. One of those who stumblingly crossed the finish line jokingly said the race was not La Union Ku Ikaika Marathon but rather La Union “Ako Iika-ika” (I am limping) Marathon. Most of those finishers who endured the heat, hunger, stress and exhaustion had to even endure not getting their finisher medals, which apparently ran out or was not enough for the registrants number in the first place. Despite of these, there were still those runners whom I got a chance to see arrived at the hotel’s lobby after their travail all smile and gamely relate their experiences of how warmly they were welcomed by the people of each barangays they passed by as if they were from the reality show of survivor series. They were even fed with lunch. I suspected that the hydrations we got along the way in each strategic portion of the race, were provided by the local people in their great desire to be part of this event. A runner even observed how over enthusiastic one barangay in their participation with the hydration that the hydration they provided were in pails with bathing pan or “tabo” which we thought were for pouring water over our head to douse away heat and perspiration but were actually being used by the marshals to fill up drinking plastic glasses. Who knows how many dipped in those pails to relieve themselves and drank from it. At 2:00 pm the old priest previously mentioned running the 42 k quitted the race. As he entered the lobby of the hotel he was escorted by the organizers, Emergency Response Unit volunteers, police, race marshals and others, whom had yet to eat their respective lunches, because they could not simply abandoned their posts while there was even a runner at the route. I recalled in that situation the fundamentalist pastor Almeda after his released by his Abu Sayaff kidnappers. Haggard and dehydrated but this time not the elderly one but all those who were with him. There were photography opportunities. While the 42 k finisher medals dried up for the other runners the organizers managed to produce one for the priest. Truly miracles occur in mysterious ways. Then of course the pack up time. I noticed there were still some products of sponsors that were left undistributed. But the organizers were seemingly eager to bring them home for themselves that they did not paid attention to the hotel front desk staffs whom were reduced to asking for some tokens themselves. I also took my cue and spirited away one of the race bibs as replacement for what I lost. Another runner mentioned that he witnessed a runner carting off unopened boxful of deodorants. The policeman who escorted the elderly runner was actually eyeing my take out Pizza. But was distracted only when one of the organizers approached him to give the latter’s thanks and offer apologies without handling the policeman as much a token or styrofoamed lunch. What really happened: The singlets should have been distributed on May 15, 2012 if not with the trouble we suffered from our supplier (BGRP Trading) who promised to deliver the singlets but failed and only able to finish the singlet on May 18, 2012 exactly 10:30PM, and the JCI President (Niki Valero) have to spend on gasoline just to pick up the singlet at Bulacan para po mahabol lang na masuot ito ng Runners before they run. For the record we paid 70K as advance payment but despite the said supplier failed to deliver the singlets as agreed and scheduled. For the record, Niki Valero, a good man as he is paid the balance on time despite of the trouble brought by the delay of the said supplier. What really happened: The event should have used a Barcode system. What was planned was the registration will stop on the 15th of May and will only accept 30 onsite participants on the eve of the event, this way the needed medals are well accounted and budgeted as well. On May 6 the estimated quantity of medals have been ordered from our supplier. However, on May 8, upon computation/assessment it was found out that the event need to raise more fund to augment the need to pay some obligations of the event, so the Financer decided to shift from Barcode to Manual timing (which is cheaper) coupled with the plea to open the registration until the day of the event in the hope to raise the needed fund. What contributed more to the shortage was the unaccounted and surprise request of the financer (two days before the event) to get atleast 40 medals as his reserved medals for his friends. Because of the turn of the event, the result was, on the day of event medal count are already short by 100plus medals. What really happened: I have to admit that due to our incapacity to acquire a more sophisticated gadget we got the route measured incorrect. We use a car in the measurement and later we found out that there is a big difference when you use a car especially if you took the right side of the road instead of taking the middle or center of the road during measurement. 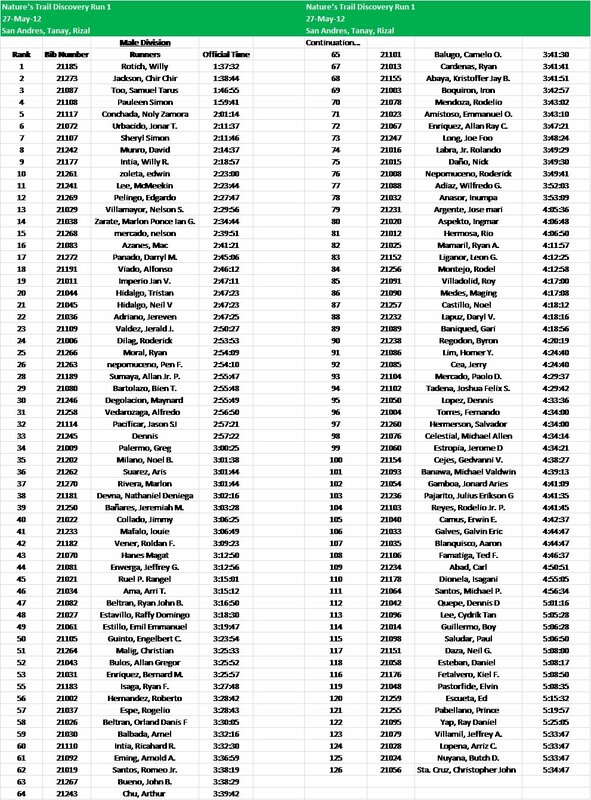 So an additional 2k was added to the 42k and an additional 1k or so is added to 21k. With regards to 5k we intentionally lengthened it to 200meters to get across to a Resort that is very supportive of our group and promised to help us out in the event. Lesson Learned: Buy a sophisticated gadget or borrow one. The truth (is on part of the iRunners) there are only two major issues that haunted us on this event; the chaos brought about during and by the release of singlet can be remedied if and only if the supplier delivered it on time, as promised and agreed by them. The medals that broke the heart of some of our runners (and Us as well) could be remedied if we only have enough sponsors to finance the event and the shift from Barcode to Manual timing could have been avoided and that could prevent the demise/shortage to happen. I have to admit that in the part of iRunners and AKO personally ay nagkulang dahil, tinanggap ko po ang project na ito na alam ko na napakaiksi ng preparasyon. The project was offered to me 1months and 28days prior to the event. I learned, we learned a lot from this experience and i know that i grow and will continually grow from it. Given a chance i will never let myself and my people go into a battle with little preparation. Given a chance again i will see to it that 6months is the minimum planning period for an event with such a magnitude. Sana po mapatawad nyo po ang aking pagkukulang, sa mga damdaming nasaktan patawad po. When Stan and I conceptualized the event we thought that at the end of the event the runners will be the one dare to say ‘i stand strong’, nagkamali ako/kami dahil the statement is aptly and more applicable to me, to us because this is what is promise to you my friends and fellow runners, iRunners will stand strong in the midst of it, to stand strong against the trials and adversary to continue give you fun and more runs here in La Union. We ask for your forgiveness and we hope to see you again (given a chance) here in La Union. Like vulture we were picking over the piled up pieces of carcasses strewn all over for any recognizable pieces of evidence of our beloved whom we feared were among those who were left exposed to the elements after their apparent massacre. I was kind of praying I won’t find any tell tale sign that will confirm what I feared, even thought dehydrated I am, profusely perspiring and bathing under the heat of the sun for almost an hour and a half; not to mentioned the 10 kilometers distance I crossed to get to the crime scene, there was nothing on my mind except to go home. There were hundreds of us helpless victim milling around. I wanted to shout in anger but there were already others who beat me to it. Besides, I am really tired. I can hardly utter a curse. I saw someone cried already. Perhaps in frustration, perhaps in anger another thing we share beside our perspiration as we brushed into each other when wave of people swept us. I heard from someone that those hapless cadavers might have been looted as there weren’t anyone guarding them. The police eventually came in throve but they were just looking dazed. One of them gave an exasperated remark, “how could they allow this desecration to happen”. I walked over to another area were those that had escaped the sordid fate of being massacred out in the open. People were in pandemonium. Pushing, shoving and shouting fiercely in desperate attempt to get attention. They were holding high their piece of paper that will identify them as claimant. The place I came to call mortuary was in state of siege from the green donning mob. At that point I was not anymore hopeful that I would be reunited with whatever remains of my beloved. Then suddenly I saw a glimmer of hope when I got a glimpse of my beloved. I scrambled to get closer while keeping my eyes on my quarry. It was a positive ID. I raised my piece of identification reference. I even pleaded with the one closest to it. I spew whatever words that would best describe the physical features of my beloved. Finally he relented and after checking the stub attached to my beloved bag and compare it with my race bib number he gave my bag to me. Thus ended my toils to get my bag back from the baggage counter from hell at the 34th Milo Marathon this morning. How could the organizers of the event allow this despicable melee to stain the prestigious event, I can only hazard a guess. It’s all about money. As soon as they got it, they have forgotten the people who gave it and ran a ton to squeeze it out of their pockets. Running is basically best done on the road than let’s say on treadmill. However, what I really meant about this piece’s title is taking my running away from the hustle and bustle of the city within Metro Manila and out of town or out of the country hopefully. 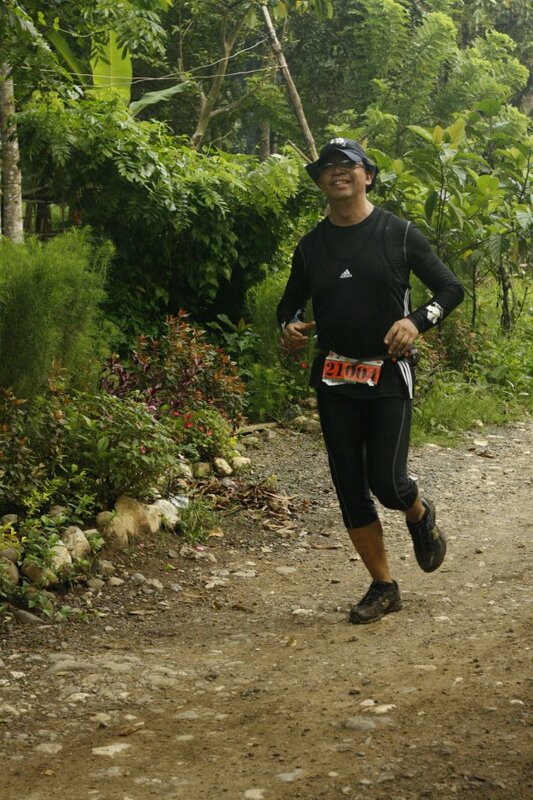 Last year running took me to the rugged terrain of Timberland in San Mateo, Rizal When I signed up for Merrell Adventure Run 2011. 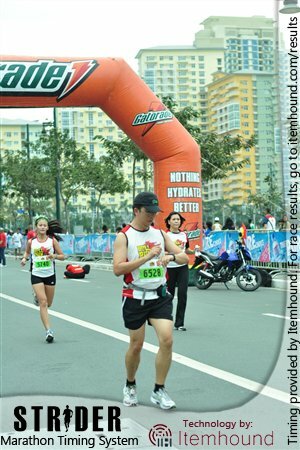 I ran also the hilly roads of Tagaytay Highlands at Nathan Ridge Run 2011. The farthest I traveled out of town to run was the run event, Skyathon 2011 held at Boracay, Aklan. This year I was even more determined to improve my record of out of town run. I started with the Baguio 21 K Run held last April 8, then on April 21 I returned to the white beach sands of Boracay for the Skyathon 2012. Then the following week I saw action in another beach run with off road trail run at Camaya Coast, Mariveles, Bataan. 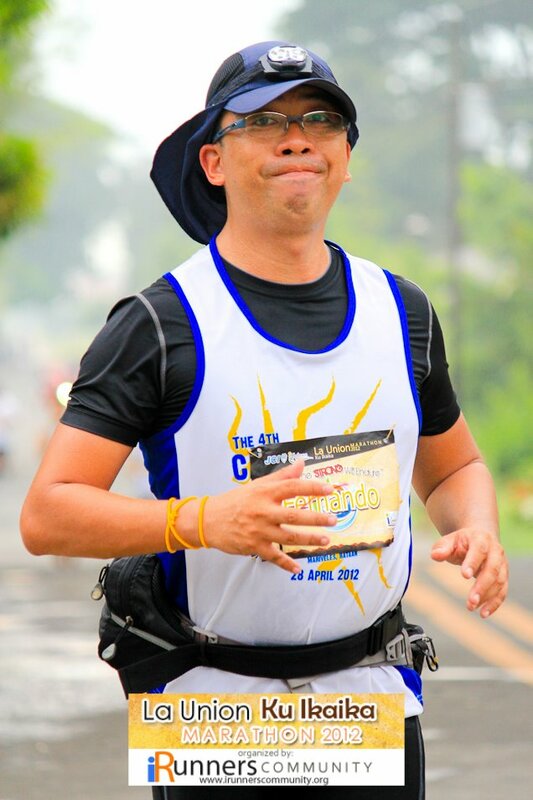 Come this May 19 I will be running in yet another beach run with combination of trail and road at San Juan, La Union. Then a week after I will be in Tanay, Rizal for the Natural Discovery Trail Run. My birthday would begin with negotiating Timberland, San Mateo, Rizal’s off road and by July 1 I will taste the off road trails at Nuvali, Sta. Rosa, Laguna. I am eyeing running at either Bohol or Camarines Sur but those two runs are during the heap of school days and would probably not possible for me to join. Another out of town run I wanted to try is the Corregidor International Half Marathon run usually scheduled in December. The thing about going out of town is that it gives me a change to get a better grasp of the place I am running at. In my previous line of work, which had me traveling from one province to another to monitor projects funded by our agency, I used to walk from the airport going to the town. When time allows me I likewise hike around the town just to get my self acclimated to the place. One time I underestimated the distance of the airport from the town at Cagayan De Oro. I may have walked for more than thirty minutes before I finally hailed a taxi and found out how far I would still have to go on if I stubbornly stick to walking. Running is just a better way for me to get around because nobody really gets lost in running in an event. There are probably race marshals signages and directional board around, and the lines of other runners heading for the finish line. Unlike when you simply go about the place as tourist there’s that uncomfortable feeling you are alone but at the same time you feel being watched. When running in an event, you are seen as akin to a celebrity. People wave at you. Cheers for you and bystanders seems all willing to lend you a hand. You are covered by a protective shield that no harm can possibly come your way even if you are right at the middle of the road.